While some rikishi experience meteoric rises up the banzuke, for others slow and steady wins the race. This was the path that Arawashi Tsuyoshi took to sumo’s top ranks. Of all the foreign-born rikishi who have ever competed in the Makuuchi division, only one has taken longer to get there than the Mongolian born Arawashi. This long and arduous path began at a 2002 junior sumo tournament. From the beginning, it was obvious that Arawashi was talented. One noteworthy spectator at this tournament was Kyokushuzan Noboru, Mongolia’s first sekitori and veritable department store of sumo techniques. Kyokushuzan was impressed by Arawashi and commented on the young man’s skill on the dohyo. Later that same year Arawashi was invited to join Araiso beya and made his professional debut at the Kyushu basho. At the same time as his debut another foreign-born rikishi, future Ozeki Kotooshu of Bulgaria, was also beginning his career. Though they may have begun together, Kotooshu advanced quickly up the ranks leaving Arawashi behind. Unperturbed, Arawashi vowed to make it to the top division to once again compete against his Bulgarian rival. Over the next three years, Arawashi made steady progress through the ranks. This progress was disrupted when a dislocated shoulder forced him to withdraw from competition and miss the first two basho of 2006. From this point on his shoulder was prone to dislocation and would afflict the young athlete on seven different occasions. Arawashi eventually relented to getting corrective surgery. While rehabilitating his shoulder, he began to study the techniques of Yokozuna Chiyonofuji, who had also suffered from shoulder dislocation issues throughout his career. In September of 2008, Arawashi relocated to Hanakago beya after his original stable closed due to the retirement of its owner. In the 2011 Nagoya basho, Arawashi was promoted to the Juryo division despite having a losing record in the previous tournament. This unexpected rise up the banzuke was due to the dismissal of several high ranking rikishi who had been implicated in the match-fixing scandal of 2011. Arawashi continued to float in and out of Juryo over the next three years. Hanakago beya would close in 2012 as a result of financial difficulties. Arawashi once again found himself transferring to a new stable. The move to his current stable, Minezaki beya, seemed to have a positive effect on Arawashi. 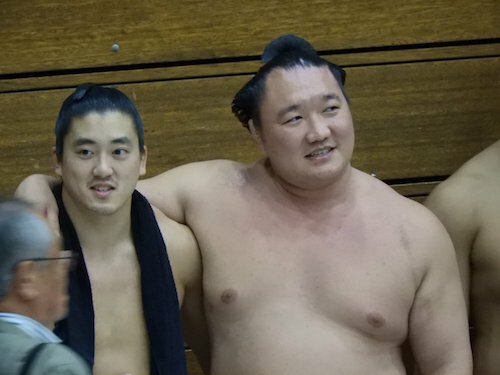 He found more consistency in his sumo and would eventually break into the top Makuuchi division at the 2014 Natsu basho. Shodai (left) vs. Arawashi (right), Kyushu basho, 2017. That’s funny, cause all my favorite Mongolians are really easy to tell apart. I have accidentally confused some of the tadpole gang a few times. I really have a problem keeping the sandanme and makushita group straight, when so many of them look similar in build from afar. Also below, I think I’d take Hikarugenji instead, no offense. I must be a bad obasan! Of course, that comic is totally cherry-picked. If, for example, I show Harumafuji and Terunofuji to someone and she or he can’t tell them apart, I’ll be arranging for a seeing-eye dog for them. Hikarugenji doesn’t have a nice smile like Arawashi. And I think sumo obasan have a preference for thick men. 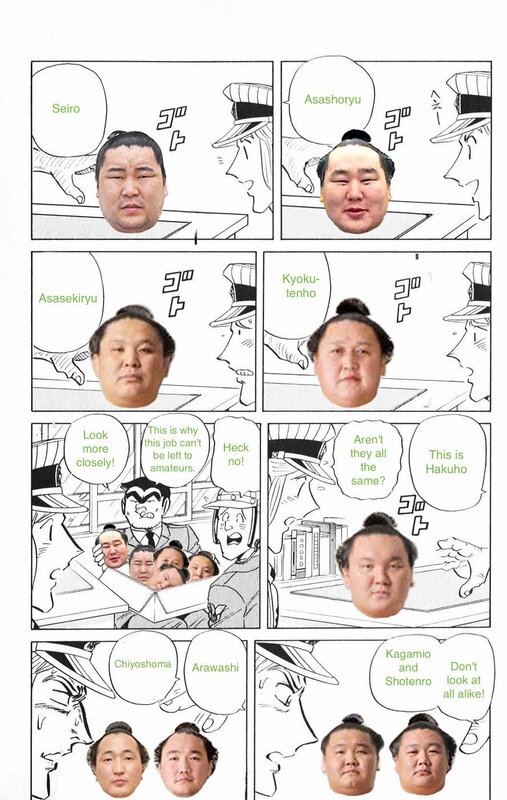 The comic reminded me of my most useless piece of sumo trivia knowledge, that Ryūko Seihō was in the live action film version of KochiKame and was the reason for the kosho seido system being instituted for injuries. Arawashi is a great obasan favorite (together with Myogiryu and now Asanoyama). Twitter is just overflowing with Arawashi photos (with or without Hikarugenji) accompanied by the Japanese equivalents of “Oooh!” and “Swoon!”. Here’s Arawashi’s win over Hakuho in January, along with a very insightful comment by yours truly — ouch just strained my shoulder patting myself on the back. There’s an implication in the article that Arawashi (I almost typed Chiyoshoma, that above thread really got into my head) had a choice of what heya to move to when his first one closed. While I’m not positive, there’s generally no choice involved as to which one to move to. The others in his stable retired, so his choice was to simply stay in sumo. It’s possible there were gyoji, yobidashi or tokoyama who moved with him, even if there were no other rikishi. There’s also multiple typos and/or spelling errors in the article right now. Sorry, I meant to say that he chose to move to a new heya instead of retire like many of the rikishi in his old stable did. I will make it clearer in the article. Thank you for your feed back.